The beauty of outdoor lighting is you will get an immediate return on your investment, while enjoying all the great benefits it will provide you and your family. Landscape lights are the first thing people see when they approach your property at night. By strategically placing outdoor lighting throughout your yard, you can showcase the great architectural features, beautiful trees, and landscape beds that ultimately increase your curb appeal. Landscape lighting adds illumination to your outdoor spaces making them usable at night. Your patio and backyard are perfect places to entertain guests, have meals, and spend time with the family. Lights that accent the front yard create a warm and welcome feeling for yourself and guest. During the winter months, many people leave their house before sunrise and return home after sunset. 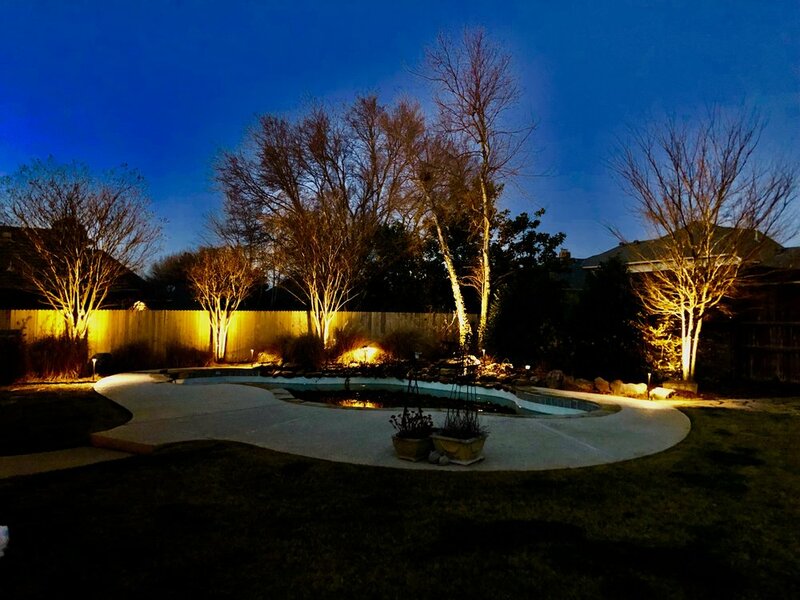 Landscape lights allow you to enjoy your yard long after the sun goes down. Not only is outdoor lighting beautiful, but it’s also an excellent way to make your home a safer place for your family, friends, and guests that visit your property. Landscape lights are a great way to illuminate sidewalks, steps, paths, and even driveways. These lights can guide people at night and help prevent injuries from tripping or falling. A well-lit yard makes your house less inviting to potential intruders and deters crime. Using lights throughout your flower beds will show off its beautiful colors. Proper lighting of statement plants or unique property features are great conversation starters. Patio lighting can be incorporated into your landscape lighting system to accent your porch or pergola. Different brightness levels of bulbs allow us to highlight your areas with the perfect amount of light. Low voltage transformers can be controlled by a timer or photocell. The new Bluetooth controllers can even be operated from your phone. This allows you to adjust the times without accessing the transformer or turn on your lights with just the touch of a finger. Low voltage wire is much safer than traditional 110-volt wire and does not require trenching up your beds and yard. Contact us today at 405-396-2100 or office@hireheartland.com if you would like more information or want to schedule a FREE consultation and estimate.